This hostel has an amazing location in Prague. You just don't have to worry, the most important places are just a few minutes, you can cook whatever you want and they also have a refrigerator so... It's up too you! 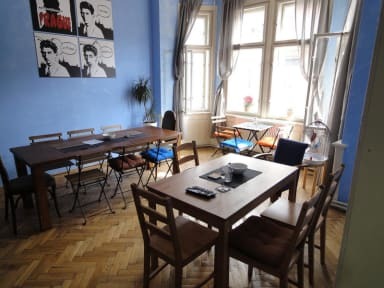 Hostel Franz Kafka is a great place to stay! They made sure to clean the bathrooms every day. Reception was very helpful to show us everything on a map. They have an in house washer and dryer! There are heaters in the rooms to stay warm in winter. Very good place! Excellent stay for a couple wanting a quiet stay in Prague. Good value for money in a brilliant location, just meters away from the main square. Secure hostel with a set of keys needed to get into the building, floor area and room required. Comfortable bedrooms, clean bathroom, helpful host and over all a pleasant stay. This isn't a party hostel and I think suited those wanting a peaceful break! Great location, a 2 minute walk from old town square, 8 to Charles bridge. The rooms were spacious but only provided a small locker (so couldn’t lock the whole bag away) - this wasn’t a problem at all for us but was just smaller than other hostels we’ve experienced. The beds were comfy and the bathrooms clean. Clean room and definitely clean bed sheets. Sound proof and had a good night sleep. Location is fantastic and near to the square. Unfortunately toilet is shared (both female and male) and towels will not be provided. The lights in the toilet are automatic so expect to be switched off in a middle of showering. Condition of the kitchen is okay as sink can be filled with unwashed pans from last night. Nevertheless, staffs are friendly. Stayed in for about 5 nights total. The room was spacious and clean. The bathrooms were decent. The place lacked atmosphere as there was no common space to catch up with fellow travellers. My only concern was that for those hoping for an early check in , there is no dedicated place to sit or rest since this hostel is based within an apartment complex. The other issue is that the kitchen area was tiny and they were running out of cutlery and plates. 100% recommed for location as its the best ! Location is perfect and the place is secured. Some observations: 1. Reception is strictly 8am to 8pm only. 2. Bathrooms were not clean as the day ends, as it were clean only once a day. 3. Mixed dorms should be mixed. No sofas or anything not very communal. Weird there’s no card machine, and we weren’t warned?? More emphasis needs to be made on the no noise policy between 10pm-8 am because we were woken up twice. Also the fridge was vile smelling. Lights in bathroom kept turning off, never any toilet paper. Bathrooms flooded. Security was good. Also think 24h reception would be good investment. The location is the only redeeming factor for this hostel. Otherwise if you’re looking for a hostel with a good atmosphere and great facilities - look elsewhere!